Party Buses Orlando provide a great way to travel throughout Central Florida without having to push yourself and your guests. With the City Beautiful you do not want to get lost when it comes to traveling in this city. With so many different destinations booking an Orlando party bus provides you with a great way of traveling no matter the number of guests you have. What makes the city great is being able to book a party bus in Orlando Florida and check out a variety of different events throughout the city whether it is a concert, sporting event, or looking to hit the night in style at one of the many different nightclubs. With a spacious Orlando party bus rental you can plan any event with your guests and know that you have a spacious ride that everyone can ride in comfortably. Enjoy traveling to Firestone Live, The Beacham, or B.B. King’s Blues Club or The Abbey where you can enjoy a great outing with your guests to one of the many different venues throughout the city. Book a 14 passenger party bus in Orlando and enjoy the ride with your friends as you celebrate a birthday, bachelor or bachelorette party. What makes the party buses in Orlando great is the fact that you can select the one that fits your guests but also have enough room to lay down, stretch your legs, and even add more passengers along the way. When it comes to celebrating with friends you want to be able to have a good time and enjoy the Orlando party bus rental the way you need to. With one of the many Orlando party buses you will be able to enjoy the surround sound system, spacious interior, options for front end seating or limo style. There are plenty of options and with a party bus in Orlando FL you will not be disappointed. Living in a city with a lot of popular theme park and tourist destinations provide you with plenty of fun and entertaining venues to check out. From Orlando International Airport (MCO) to hotels in Downtown Orlando like The Point Orlando Resort or The Floridian Hotel & Suites. You can travel with your family in the Orlando party bus straight to Disney or Universal Studios. With this city being such a big family destination you are going to be pleased by how comfortably the airport transfer service is going to be. Party Buses Orlando can help start or end the vacation in style. Many Orlando party bus interiors provide surround sound for music and even television that the children can enjoy. This is a great opportunity for them to enjoy riding comfortably in one of these vehicles. If you have a big family and are enjoying your family reunion you can book a party bus in Orlando that sits over 50 passengers. The ride will be entertaining but also enjoyable for everyone involved. 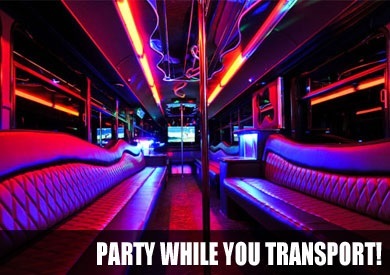 We have plenty of party buses in Naples, FL available. Party Buses Orlando is going to take you to your destination whether it is a night club with your friends or a family vacation. With the many different party bus sizes you can find yourself inside one of the most enjoyable rides you have ever been in. With the ability to move around the vehicle without stepping on anyone Orlando party buses are ready to get the game off on the right foot. When you do decide to book a party bus in Orlando just know that you have the opportunity to just focus on talking with your guests. The chauffeur service is what separates from riding in a regular taxi service. From 14 passengers to 50 you select the party buses in Orlando that will make your trip a success. 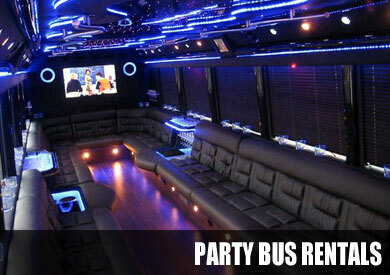 You can rent a party bus in Pompano Beach, FL for all kinds of special occasions as well.